In Kamloops, British Columbia, Canada, a group of volunteers are hosting bottle/can drives to help fund a veteran Street Signs project. In order to remember those that have made the ultimate sacrifice, the Kamloops Heritage Commission wants the names of fallen heroes to be enshrined on street signs. In addition to the drive, the group had preliminary designs of the new signs planned out. The most notable change is the inclusion of a red remembrance poppy. Each sign that features the name of a soldier who died while at war will include a poppy. 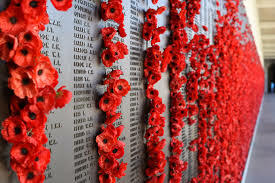 Poppies, for those unfamiliar, have been the emblem of remembrance day since they were first worn by soldiers in 1921. The tradition has continued to this day and now the flower is synonymous with Veteran’s Day for nearly every country in the Commonwealth. The heritage group has been working on this project for more than a year, speaking in front of everyone from city council to veterans. While the group continues to push for the new street signs, the city still isn’t willing to pay for them. So the Commission has taken it upon themselves to fundraise more than $8,000 for the signs. While the initial goal is to replace 52 current street signs with the redesign, the overall goal is to have all 283 names commemorated in street signs and street names around the city. Those involved hope to have the first street sign ready and installed by Remembrance Day, November 11.